¶ 4 Leave a comment on paragraph 4 0 Clancy also mentioned the contributions of Polish citizens during the Revolution to highlight a “high place” they had earned in American history.2 Polish-American groups broadcast the achievements of Revolutionary War heroes to anchor their people to the origins of the United States and to distinguish themselves from other eastern Europeans by showcasing their long history of being loyal Americans. 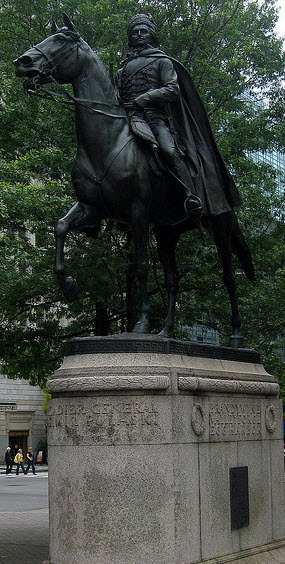 ¶ 6 Leave a comment on paragraph 6 0 Efforts began in the early twentieth century to recognize the contributions of Count Casimir Pulaski and General Thaddeus Kosciuszko with statues and postage memorials. 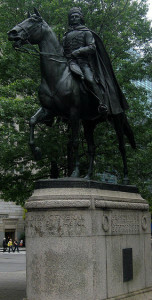 In 1910, monuments honoring both men were dedicated in Washington; Pulaski’s financed by Congress and Kosciuszko’s donated to “the people” by the Polish American Alliance.3 Pulaski was a Polish nobleman who volunteered to fight for the colonies and is known as the Father of the American Calvary. He fought and died at the Battle of Savannah in 1779 and the city honored him as a local hero. 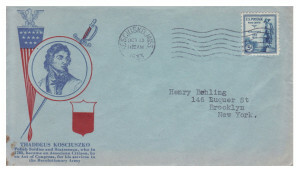 To further extend Pulaski’s reputation as a national hero, the local chapter of the Daughters of the American Revolution spearheaded a stamp campaign in 1929. They co-sponsored an event commemorating the 150th anniversary of the fall of Count Pulaski at the battle of Savannah, Georgia. Supporting the DAR’s efforts to secure a stamp was Georgia Congressman Charles Edwards, who petitioned the Postmaster General to support a Pulaski commemorative and commented that “the Daughters of the American Revolution would not sponsor anything that is not real meritorious and entirely worthy.” According to Edwards, the DAR properly vetted the stamp’s subject matter and it passed their patriotic test demonstrating Pulaski was an early model Polish immigrant. 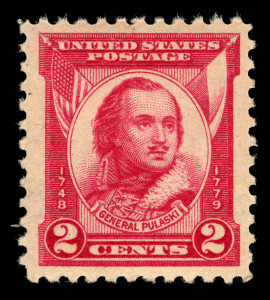 Honoring Pulaski as a war hero was not in question when President Herbert Hoover declared October 11, 1929 as “Pulaski Day,” yet no stamp came.4 Hoover and Congress acknowledged Pulaski as a national hero, but earning a commemorative stamp proved more difficult. ¶ 8 Leave a comment on paragraph 8 0 Surprisingly the following year, strong rebukes came from a Polish newspaper that may have influenced the government’s decision to print a Pulaski commemorative. The paper accused U.S. postal authorities of using a “double standard” when choosing whom to honor on stamps with the headline, “Polish Proposition Refused—Germans Favored.” According to this paper’s editor, the USPOD honored a German Revolutionary War hero, Baron Frederic Wilhelm von Steuben, on a stamp, and refused to reciprocate for a Polish Pulaski. ¶ 9 Leave a comment on paragraph 9 0 French newspaper editors even decried the choice of the von Steuben stamp. They did not seek a Pulaski stamp, but rather sought recognition for French military officers who fought for independence, including Lafayette and Rochambeau. Missing from the correspondence file were panicky or angry letters from government officials strongly urging the Postmaster General to order a Pulaski stamp quickly. A few months later, however, nearly fifteen months after the Savannah anniversary celebration, a Pulaski issue was announced.5 This episode demonstrates that the world noticed when a government printed new stamps, placing postal officials in a challenging role. Their decisions held enormous political weight and carried cultural meaning far beyond those petitioning for stamp subjects. ¶ 10 Leave a comment on paragraph 10 0 This can been seen in the ways that non-collecting Americans noticed new stamps and questioned the reasoning behind postal choices. 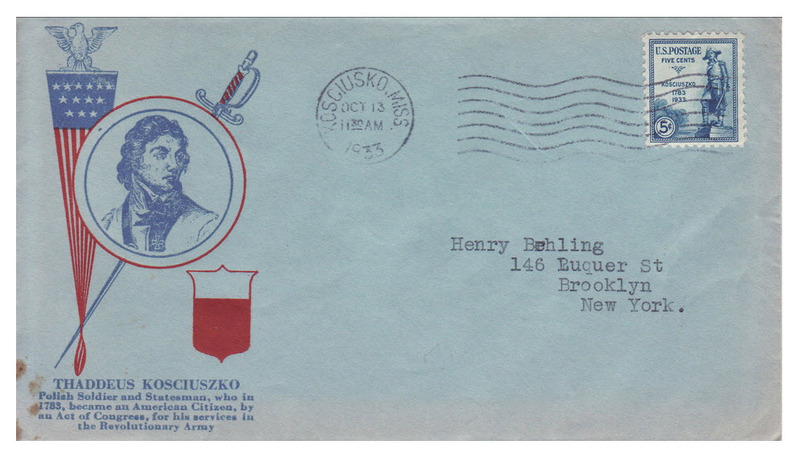 Present in the archive’s files for the Pulaski stamp was an angry letter from a citizen who asked why the USPOD honored Pulaski with a stamp and did not chose an American soldier instead. She spoke of her fears of first-generation immigrants held by many fellow citizens. Mrs. M.A. Van Wagner criticized Polish immigrants for coming to the U.S. only to “get employment here and take our American dollars back to Poland” while others remained unemployed (presumably she meant native-borns) in the early years of the Depression. For Van Wagner, the Pulaski stamp signified another way that America had been “forgnised” similar to the “gangs” of foreigners who were responsible for importing “poison” liquor during Prohibition.6 Her letter stands alone in the Pulaski file as one of protest, but her emotional reaction to this stamp reflects real sentiments felt by some Americans in the interwar period not only towards eastern European immigrants, but also in the power she felt stamps possessed in representing, or perhaps misrepresenting in this case, an official narrative of her country. Stamps may have been small, but their images were powerful. ¶ 11 Leave a comment on paragraph 11 0 Many Americans supported the immigration restrictions in Johnson-Reed, so viewing an eastern European, Pulaski, on a stamp may have angered them. It seemed hypocritical of the government to limit immigration of specific groups of people because they were not considered fit for citizenship, and then a few years later honor an individual representing one those groups on a federal stamp. This occasion was not the first time the U.S. government recognized the achievements of Pulaski, but the accessibility of a commemorative stamp meant that more people—across the United States and around the world—saw first-hand that the federal government celebrated a Polish hero as an American one. ¶ 15 Leave a comment on paragraph 15 0 Citizenship was a key element in pitching this stamp, which also was reflected in the announcements printed in newspapers. Kosciuszko’s “admission to American citizenship” and the “privilege of becoming a citizen” were celebrated alongside his military service. 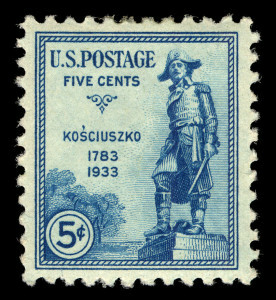 Much like Farley who paid homage to Polish citizens, other reactions to the issue emphasized that the General’s legacy on a stamp “honors not only the man himself, but his countrymen who have come by the hundreds of thousands to the country he helped to establish as a land of liberty for all men.”10 Whether Kosciuszko actually became an American citizen was not questioned at the time, but the stamp offered a strong symbolic gesture and honor for all people with Polish heritage as bestowed upon them by the government. Like the pre-revolutionary pilgrims, the Polish were nation builders, too. ¶ 17 Leave a comment on paragraph 17 0 Kosciuszko hoped to lobby support for Polish independence from American and French governments, but found himself politically opposed to John Adams’s anti-France policies. In light of the Alien and Sedition Acts of 1798, Thomas Jefferson urged Kosciuszko to leave the country to avoid imprisonment. 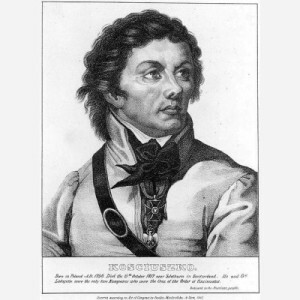 If Kosciuszko had been naturalized, he would not have needed to flee the country. According to Congressional records in 1976, Representative John H. Dent tried to rectify that by submitting a resolution to confer citizenship upon Kosciuszko, perhaps in the spirit of the Bicentennial celebrations. Kosciuszko’s actual status was less important than the way that Polish-American cultural groups constructed his historical identity as an American citizen.12 These groups believed there was a lot at stake by representing Kosciuszko as a citizen as well as a military hero. Polish immigrants and Polish Americans were conflicted, much like immigrants and citizens of Norwegian descent discussed earlier, about how best to balance their cultural and political identities as Poles and as Americans. ¶ 20 Leave a comment on paragraph 20 0 Pulaski visually is associated with Poland with his portrait flanked by the modern flags of Poland and the United States. Generally, other commemoratives did not print the U.S. flag. Pulaski’s portrait appears in the center where he casts his glance to his left, to the side where the Polish flag appears from behind his portrait. In contrast, the Kosciuszko design did not feature either flag. 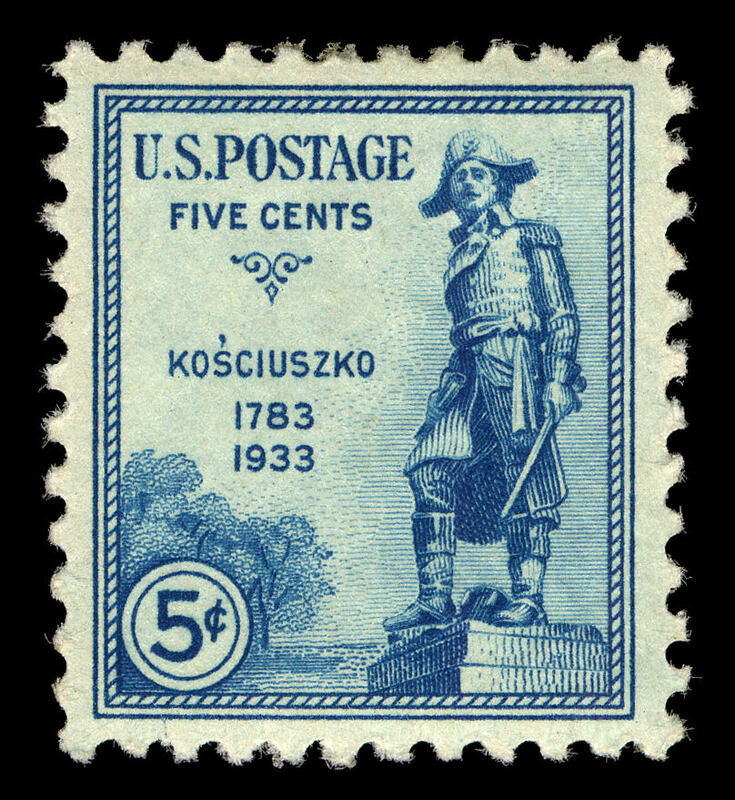 Perhaps because the stamp commemorated the 150th anniversary of his “naturalization” as an American citizen, flags were not necessary for indicating his nation of origin; Kosciusko was American, Pulaski was Polish.13 The final design represented Kosciuszko standing as a military officer, distinguishing him from other Revolutionary War citizen-soldier stamps, and instead identified him as a leader. ¶ 25 Leave a comment on paragraph 25 0 Polish American groups received help from the USPOD in proving their people to be fit and loyal American citizens, since their ancestors fought to establish the United States as an independent nation. The legal and cultural murkiness of racial classification in the early twentieth century made it more imperative for first and second generation immigrants to be able to stake their claim to whiteness. For Polish immigrants, earning two stamps helped.